Through this report, I will measure suitability of various Industry sectors for you, based on astrological signatures present in your horoscope. It may be an extremely helpful document for you while making investment decisions in stock market. 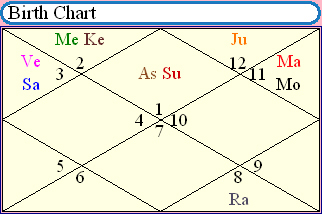 As per the above birth-data, your Vedic (sidereal) ascendant is Aries ('Mesh'), the Vedic Moon sign ('Rashi') is Aquarius ('Kumbha') and Janma-nakshatra (birth-star) is Shatbhisha (pada-1). Please be reminded that do not confuse it with your tropical (Western) ascendant and tropical Moon-sign, which may be same or a sign higher (in your case, tropical ascendant is 'Aries'). The Second house is the house of livelihood. It relates to earning capacity and our ability to provide for ourselves in life. Wealth & Property, Status, Fortune, financial condition, ability to acquire material resources, self acquisition are signified by Second house in general. The Eleventh is the house of gains. It shows income or what brings us increase. Gain of money, accomplishments, income, prosperity, hopes, wishes, aspirations, ambitions, attainment of welfare etc. are signified by eleventh house. The Ninth House is the prime house of grace, fortune, and luck, and gives sudden and unexpected gains in life. Those who win lotteries or races usually have good influences from this house. The fifth house is 9th from the 9th house and therefore is another house of wealth and fortune. As such it shows our capacity to gain through speculation (like the stock market), how we can gain through our productions, creations, recreation, and imagination. Therefore, to assess the investment suitability in various industry sectors, properly, we need to check 'Inclined Beneficence' of various planets towards above described houses in a horoscope. The 'Inclined Beneficence' is primarily based on relation of a planet with concerned houses, their lords and their dispositors. Planet's own dignity, exaltation and some other factors also affect the beneficence values. The 'Excellent', 'Good' and 'Fair' categories indicate positive, favourable and desirable results - in descending order respectively. The 'Average' represents moderate results. The 'Inadequate', 'Poor' or 'Worst' categories indicate negative, unfavourable and undesirable results in ascending order. Thus, 'Excellent' is most desirable and 'Worst' is most undesirable category. You should observe extreme prudence and caution with 'Poor' and 'Worst' categories. In a horoscope, there may be more than one planet in a particular category. In the same way, it is not necssary that all 7 categories are represented in your horoscope. Some categories might remain vacant. Here-in-below is a comprehensive report which identifies suitability of various industry sectors for you, based on astrological signatures present in your birth-chart. Each industry sector is signified by one or more planets. This report will give you guidance about the industry sectors in which you should (or should not) make investments. You should select a stock which belongs to a suitable industry sector, categorized as 'Excellent' or 'Good'. Petrochemicals companies, Plastic processing industry. Industry, Markets and Commercial centers. TCS, INFOSYS, Polaris, HCL etc. ), Bio technology Industry. The above industry sectors, categorized as 'Poor' and 'Worst', should be avoided by you as far as possible. These sectors will be harmful to your financial health and prosperity.